The late David Rozga, an 18-year-old athlete and band standout from Indianola, on Wednesday became the face of a national fight to make illegal a new batch of man-made designer drugs sold in retail shops. His father, Mike, testified Wednesday during a hearing at the U.S. Senate, advocating a ban of the drugs. "The message I want to leave you with here is we're not doing enough, and we're not moving quickly enough," Mike Rozga said. Synthetic drugs that mimic cocaine, meth, marijuana and other illegal drugs are making users across the nation seriously ill, causing seizures and hallucinations, according to toxicologists. The chemicals are suspected in at least nine deaths in the United States since last year, including the death of David Rozga. The teenager got high last June on a marijuana look-alike product called K2 and complained to a friend "that he felt like he was in hell," his father said during the hearing. He was "terrorized by the drug and shot himself." The products are often packaged as incense or so-called bath salts and can be obtained for as little as $10 at shops that sell drug paraphernalia. As more people experiment with them, the results are becoming evident at hospitals: a spike nationwide in the number of users who show up with problems ranging from labored breathing and rapid heartbeats to extreme paranoia and delusions. Data from the American Association of Poison Control Centers show an increase in the number of people seeking medical attention after using synthetic drugs. Most of the calls came from doctors and nurses reporting patients in emergency rooms. At least 2,700 people nationwide have fallen ill since January, compared with fewer than 3,200 cases in all of 2010, according to an analysis requested by the Associated Press. "Many of the users describe extreme paranoia," said Dr. Mark Ryan, director of the Louisiana Poison Center. "The recurring theme is monsters, demons and aliens. A lot of them had suicidal thoughts." In some patients, symptoms can last for days. "One described it as like being on cocaine, but 10 times worse," said Anna Rouse Dulaney of the Carolinas Poison Center in Charlotte, N.C. 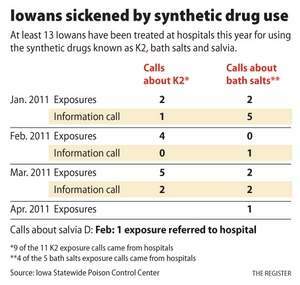 The trend is less marked in Iowa, with 17 reported negative exposures to various synthetic drugs so far in 2011, the Iowa Statewide Poison Control Center said. Sens. Chuck Grassley, R-Ia., and Dianne Feinstein, D-Calif., introduced federal legislation, the David Mitchell Rozga Act, to ban the chemicals used to make K2. Iowa is considering its own ban on K2, but the legislation is imperiled by partisan arguments. The version Iowa House Republicans prefer includes K2, salvia divinorum and drug-infused bath salts. It would impose harsh penalties, making a violation a Class C felony. Senate Democrats have said the ban should be only on K2 and not carry penalties harsher than for possession of marijuana. "The problem is, this is a more dangerous drug than marijuana," said Sen. Kent Sorenson, R-Indianola, who backs the broader, tougher version. "My fear is it's on the verge of dying, which I think would be a tragedy." But Rep. Clel Baudler, R-Greenfield, said Wednesday night that he thought a compromise had been reached. The bill would include all the chemicals previously proposed by the House, but violations would be a Class D felony. HISTORY: Recreational drugs created in the laboratory, such as LSD, have been around at least since the middle of the 20th century. But the latest versions emerged only a few years ago, starting in Europe. SYNTHETIC MARIJUANA: It's often dried plants sprayed with chemical compounds. It's packaged to look like pot, and users typically smoke it, but experts say the high is more comparable to that produced by cocaine or LSD. DANGERS: These synthetic substances have toxic effects whose symptoms include racing heart beat, elevated blood pressure, hallucinations and significant paranoia that has resulted in harm to individuals including suicide, according to testimony to both the U.S. Senate and Iowa Senate by Dr. Anthony Scalzo of the Saint Louis University School of Medicine. OTHER STATES: At least 20 states have banned chemicals found in fake marijuana. Most others have legislation pending. At least nine states have banned substances found in bath salts, and 25 have laws in the works. WHAT'S NEXT: The U.S. Senate Judiciary Committee will consider the K2 bill and may expand the bill to include other types of synthetic drugs. Legislation is also pending in the Iowa General Assembly. The Iowa Pharmacy Board in July adopted an emergency rule that temporarily banned K2. However, the rule will expire later this year unless the Legislature acts this session to make the ban permanent. Rozga hopes a ban becomes law. "This will be as close as my family will get to convicting his killer," he said in a telephone interview from Washington, D.C. "To them it's politics. To us it's personal." Feinstein told Rozga during the hearing: "Your testimony makes it very human and very real. Thank you." Rozga and his wife, Jan, had never heard of K2 until 10 months ago, but now find themselves in the uncomfortable position of fielding questions from experts and collecting other families' tragic stories. In the United States, fake marijuana was last year's big seller, marketed under brands such as K2 or Spice. This year, the trend is bath salts, with names like Purple Wave and Bliss. The Drug Enforcement Administration recently used emergency powers to outlaw five chemicals found in synthetic pot, placing them in the same category as heroin and cocaine. But manufacturers are quick to adapt, often cranking out new formulas that are only a molecule apart from the illegal ones. In Des Moines, near Drake University, the Day Dreams shop has found the synthetic marijuana Spice to be a proven moneymaker. Along with incense, hippie clothing and drug paraphernalia, the store has sold thousands of packets of the crumbly, brownish-green leaves. Besides being cheap and easily obtained, the synthetic drugs do not show up in common drug tests. DEA agent Gary Boggs said users assume that the products are safe because they are available in stores, even though they are typically labeled "not for human consumption." "These products are in an unregulated, unlicensed industry," Boggs said. "No one knows the strength of the ingredients. You don't know what you're taking." In addition to the DEA's recently adopted ban, a federal law allows for prosecution of "analogue" drugs that mimic the effects of illegal substances. But authorities acknowledge the challenge of stopping the drugs' spread. DEA experts are evaluating as many as 50 new synthetics. "There are probably hundreds of formulations out there," Boggs said. Contrary to DEA claims that the product is most popular among young people, Day Dreams co-owner Kathy Fiedler said two-thirds of her buyers are middle-aged. "I even have grandmothers coming in," said Fiedler, 56. If Iowa lawmakers adopt a ban, she said, they risk opening the door to shady backroom chemists crafting far more dangerous things, she said. Reports of misuse are widespread. In Kentucky, authorities say a woman driving on a highway after using bath salts became convinced her 2-year-old was a demon. She allegedly stopped the car and dropped the child on his head. He survived and was taken from his mother's custody. A Hawaii man pleaded guilty of attacking his girlfriend and trying to throw her off an 11th-floor balcony while high on Spice. David Rozga's parents said their son had been active in his church and was preparing to start college in the fall. Jan Rozga hopes the law will be her son's legacy. "I did not stop being David's mother when he died," she said. "I still feel very protective over him, what happened to him, and I want to right that wrong for him."